One City Youth: Simon Students are Shining Bright! Simon Elementary School, located on Mississippi Avenue, has many student achievements to celebrate. 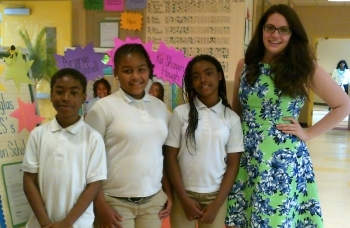 In May, Whitney Bartell's fifth grade students, Ka'Shawn Hough and Arjanae Mitchell were two of ten winners of the National Capital Lawyers Auxiliary's (NCLA) Law Day essay contest, while another, Kavon Douglas, was named as a Carson Scholar. When Bartell suggested the Carson Scholarship and NCLA Law Day essay contest to Douglas, Hough, and Mitchell, it didn’t take much convincing to get them to apply! Not only do the three students have superior grades, they are leaders in the classroom. Hough and Mitchell were honored at the NCLA awards ceremony where they read excerpts of their essays in front of Justice Sotomayor. After the ceremony, they were able to meet Justice Sotomayor and receive an autographed copy of her most recent book. What makes this achievement even more special for Douglas and Hough is that as siblings, they can celebrate together. “They're very competitive, but they're very, very close,” said Bartell. Despite constantly competing academically, they support each other's accomplishments. Keep up the great work Simon Elementary School! Read the full story on Capital Community News.